This is the story of a sensational journey to the conquest of the North Cape. A journey that started from the Venetian lands, from the top of an historic and legendary mountain like the Monte Grappa, and ended in one of the most beautiful places of the world; an earthly paradise. 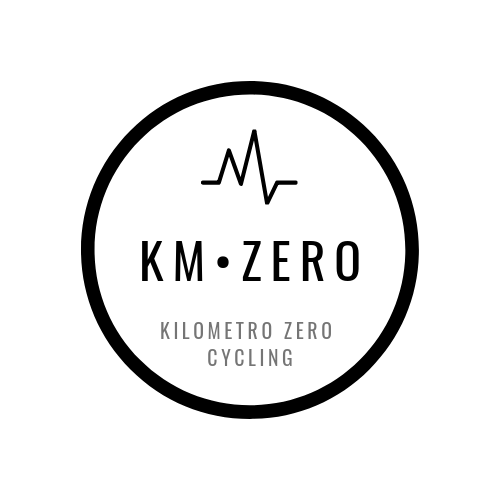 An experience of pure cycling, lived at 360° and without stopping. One of those trips that remain impressed forever in your life. Writing a report is not my forte and describing our thirty-one day adventure in a few lines is not at all easy. We are Nadia and Livio and for fifteen years we have been cycling, but for a couple of years we have been passionate about cycling trips. First Munich, Rome and Berlin with a group of cyclists, then Paris, Vienna and Prague with a friend: these are the trips undertaken so far, but I felt that they were not yet enough. One destination remained fixed in my mind: North Cape. Finally in 2017 I can convince Livio to accompany me. Throughout the winter I document myself, read books, observe maps, trace possible routes, planning the trip evening after evening, adjusting it every time until the long-awaited day. 30 June 2018. Let’s start from Cima Grappa, a mountain that I particularly love and to which I am linked because I am part of the staff of the homonymous patent (Brevetto del Grappa patent). We expect to cross Europe touching five countries, cycling for a total of 4300 kilometers with 27000 meters of elevation gain. We get on our well-equipped bikes and descend from Cima Grappa carrying 40 kilograms of weight Livio and 30 more me. Heading North Cape. We pass through Austria, Germany, Sweden, Finland and Norway. We have fixed stops, but we live the day, so sometimes, instead of sleeping in equipped campsites, we camp by the sea or near a lake, near cool forests or in desolate lands. The weather is favorable: it rains only two nights and a couple of hours a morning, refreshing an abnormal summer in which the thermometer marks an average of 28° C in Sweden, and so also to “Napapijri” 66° parallel, up to 24° C of Cape North, reaching along the way peaks of 34° C degrees. Our daily priority is to get water, something that may seem easy, but along secondary roads, supermarkets and distributors you can’t see even for a few days, so we are forced to supply ourselves at the taps of the cemeteries. We are not the only ones who suffer from the heat: along the way thin reindeer swim in the sea, which is not something that happens to see every day! To avoid the E4, Sweden’s main artery, we also travel 70 km of dirt roads a day. Roads on which it is difficult to pedal with so much weight to carry on, fatigue that worsens even more after a few days, when a spoke of the rear wheel breaks. Not many days have passed since another spoke decided to abandon me, forcing us to look for spare parts. The fatigue, the distance from home, the discomfort of not finding suitable parts weigh more than the weight we carry with us, until one day we buy a new wheel from an all-rounder. We are back on the road, we set off again at full speed on long and desolate roads, against a strong and constant wind every day. There is no hurry, however, we enjoy ourselves kilometer after kilometer, up and down, enjoying every landscape that nature offers us: endless expanses of clear water, cultivated fields that outline the horizon, soft mountains that serve as a backdrop, pristine forests, and all seen with a different light, particular, a light that accompanies us around the clock, a light that sometimes prevents us from sleeping at night. We do not give up, this too is part of a different journey, unique, all our own. 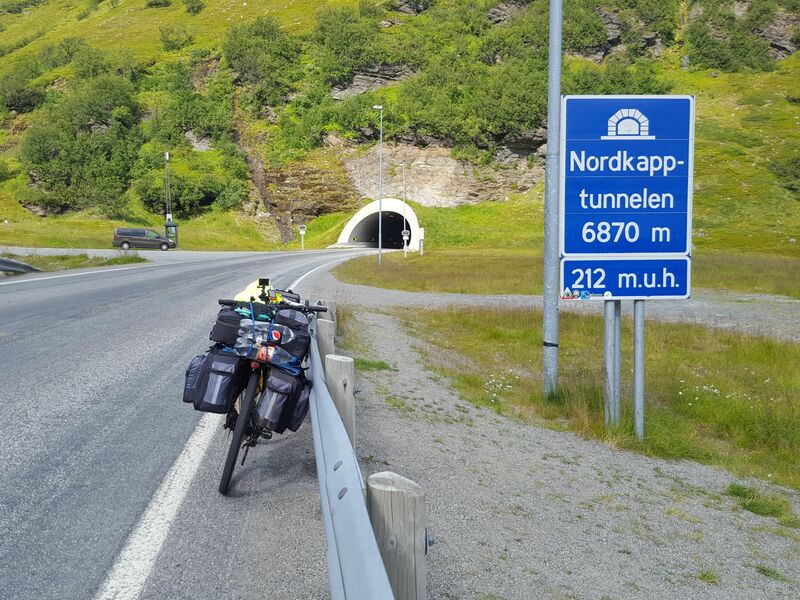 By now we have arrived, we read “Nordkapptunnelen”, a seven kilometer long tunnel that separates us from our destination. We go down to two hundred and twelve metres below sea level, but we go up again with strength and vigour, because no matter how hard our legs, it is the heart that pushes us harder. Let’s see the light. We have arrived. 4326 total kilometers, with a positive difference in height of 27742 meters, 31 days of non-stop travel. There he is, that black iron globe, symbol of the world, located on the northernmost point of continental Europe. 16:00 on July 30: I set the time that I will never forget, I set the moment that resounds with infinite joy, shared with my life companion. A personal achievement, a satisfaction that can only be imagined. We enjoy the moment, the day, the moment that encloses a journey. We wait for midnight, we enjoy the sun caressing the water without hiding and illuminating the night with a soft orange color, as if it were a very long twilight. Maybe we could stay there again. In that place I leave a piece of my heart and one day I would like to go and pick it up.